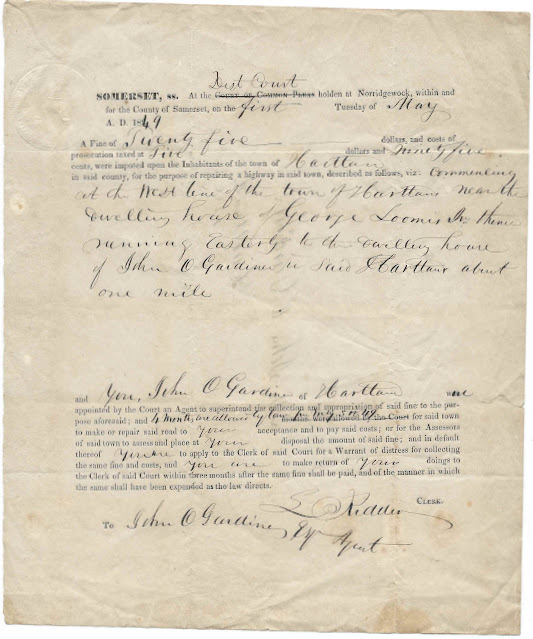 May 1, 1849 document from the District Court of Somerset County at Norridgewock, Maine, reflecting a fine of $25 and prosecution costs of $5.95 assessed against the inhabitants of the town of Hartland, Maine, for the cost of repairing a highway in their town. The document was directed to John O. Gardner of Hartland; he is also mentioned as one of two men whose property the applicable portion of the highway runs between. 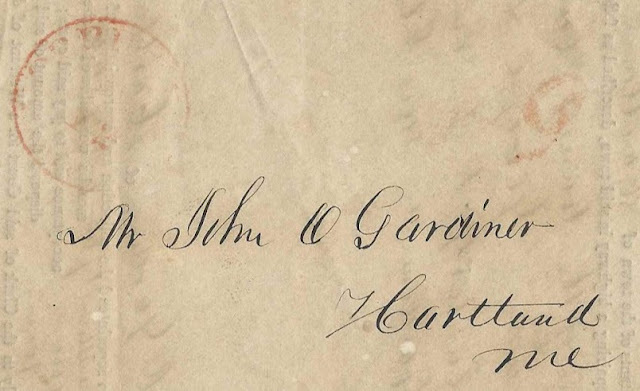 The document was signed by the Somerset District Clerk of Court L. Kidder, who was Llewellyn Kidder. George Loomis, Jr.; the applicable portion of the highway runs between his property and that of John O. Gardner. 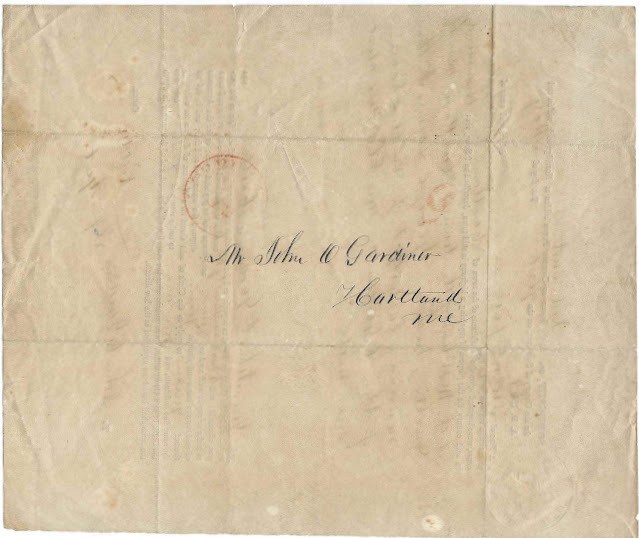 The section of highway is described as "Commencing at the West line of the town of Hartland near the Dwelling house of George Loomis, Jr. thence running Easterly to the Dwelling house of John O. Gardner in said Hartland about one mile." John O. Gardner was born October 1, 1807 at Canaan, Maine. He married Eliza Connor in 1835 at Skowhegan, Maine. Llewellyn Kidder was born November 16, 1813 at Canaan, Maine. According to History of the old towns, Norridgewock and Canaan, comprising Norridgewock, Canaan, Starks, Skowhegan, and Bloomfield, from their early settlement to the year 1849; including a sketch of the Abnakis Indians, by J. W. Hansen and published in 1849 at Boston, Massachusetts, Llewellyn Kidder became clerk of the court in 1847. He married Mehitable Merrill Robinson in 1840. 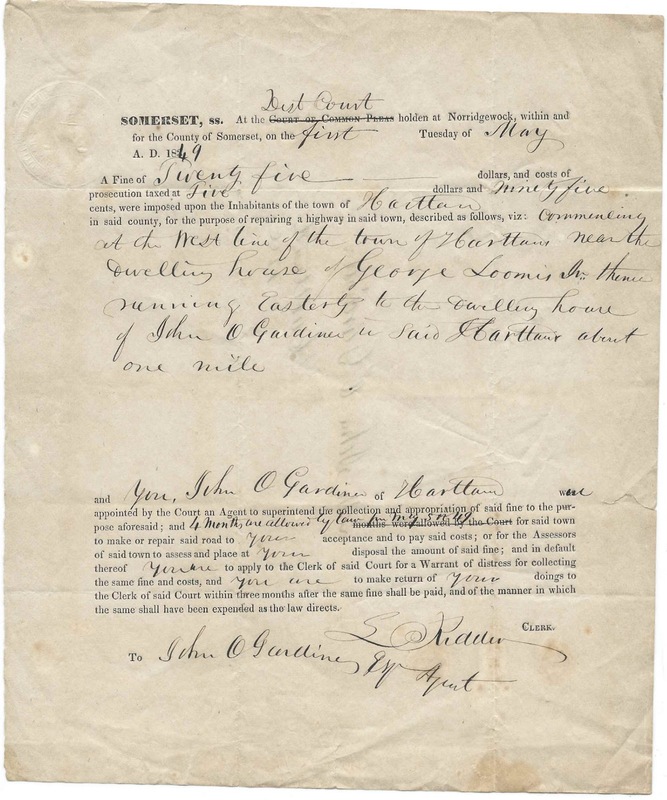 George Loomis, Jr., may have been the George Loomis, Jr., who was born May 27, 1813 at or near Skowhegan, Maine, son of George and Martha (French) Loomis. He married Randilla Baker at West Forks, Maine, in 1843.